Find out more about Durham, Darlington, Teesside, Hambleton, Richmondshire and Whitby sustainability and transformation partnership (STP) including details of its population size, constituent organisations and priorities. Preventing ill health and increasing self-care. Helping to stop people from becoming poorly and helping to manage their health and any medical problems they already have. 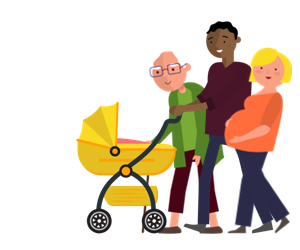 Supporting people to stay well and independent for as long as possible by improving health and care services within their area. Through the Better Health Programme, improving the quality of care in hospital and making sure that people get the best treatment and see the right specialist. Using technology in healthcare to improve the ability to diagnose, and develop more convenient treatment options for patients. Our vision: Meeting our communities’ needs now and for future generations with consistently better health and social care delivered in the best place. The following organisations are part of Durham, Darlington, Teesside, Hambleton, Richmondshire and Whitby STP. For individual contact details for these organisations, please see the NHS website.